This is based on Alex Goh's Basic Flavour Chiffon Cake but with my own modification. No coconut milk is used. 1. Preheat oven 170C - 180C. 2. Sift (C) twice, set aside. 3. Cream (A) until sugar dissovled using hand whisk. Add in (B) in the order listed. Mix well after each addition. 4. Fold in sifted flour and mix well. 5. Beat egg whites until frothy, add cream of tartar and beat till soft peaks. Add sugar and beat till stiff peaks. 6. Fold 1/2 of the egg whites into egg yolk mixture, gently with a rubber spatula until just blended. 7. Pour yolk mixture (step 6) into the rest of egg whites, fold it gently with rubber spatula until blended. 8. Put batter into a 20cm chiffon cake pan, bang the pan on a hard surface to release the bubbles and bake at 170C - 180C for 40 - 45 minutes or till cooked. 9. When the cake is cooked, remove from oven immediately and give it another bang on a hard surface. Then invert the cake to cool. Remove the cake from the cake pan when it is completely cool. So nice and fluffy. Have tried to bake chiffon cake but always not successful. The bottom of the cake is sunken when inverted to cool(when unmould).The height of the cake is not favourable and the texture is too cakey. Sigh! Must have been the egg whites and the folding technique. Aifan & makan kaki, thanks for your compliments. Connie, thks for the recipe. I also have Alex Goh's recipe book, hehe. How does it taste like without coconut milk? Your chiffon cake rises so evenly. The recipe that I usually use for chiffon cake will result in a very high chiffon cake with a dome top, making it looked like a mountain (if I don't trim it). I have this book too but I haven't tried this recipe. Will give it a try soon. Btw, I have baked Pandan Chiffon cake, both with and without coconut milk. I have to say that the one with coconut milk will give it a richer taste and aroma but the one without is also as good in its own way. Simpler taste and not cloying. IMHO. 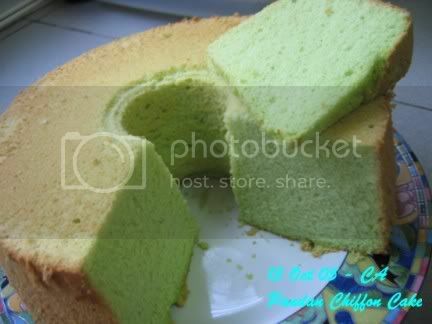 Your pandan cake chiffon cake looks so good. Will try your receipe. Mycoffee - Thanks for telling the difference between Pandan Chiffon with Coconut Milk and without it. Sweet of you.... "Kiss kiss"
So how to gauge when to stop whipping the egg white coz honestly, it's difficult to gauge when you don't know what you're looking for. Ok, stiff peak but how stiff? The mixture will get thicker as you go on. Can you share your success? You make me very shy lah! I am also still learning. The other day, I was trying to make Cheddar Cheese Chiffon Cake (modify my own recipe here and there) and it turned out to be a disaster... Ha ha ha! But not giving up yet.... Basic rules are to make sure eggs are at room temperature, Whisk and Bowl must be oil free. 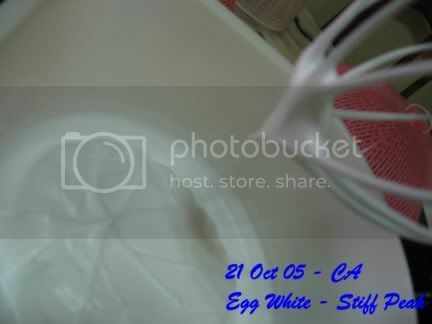 I managed to take a photo of my egg whites at stiff peak stage today. Hope this is helpful to you! I have baked twice and for both occasions, the results were not encouraging as I read somewhere at this site that I should bake the cake using bain maire techniques. My cake was very damp although I wrapped my baking tin with aluminium foil. What is wrong? Should I just bake it the normal way rather than bain maire techniques? I am not an expert in baking but I will try to help as much as possible. I have never baked chiffon cake using water bath method. So, I cant tell you the difference. As I learn baking using recipe book on my own, I just follow what is stated in the recipe book. So far, all the chiffon cake recipe says to bake in pre-heated oven 170 - 180C for 35 - 40 minutes. Why dont you try baking the normal way? Also make sure you dont take too much time folding and blending egg white and egg yolk mixture. The batter will become runny if it takes too long to mix. Batter should be thick. I have posted my chiffon cheesecake batter photo in Chiffon Cheesecake for reference. Hope this helps! Just want to share a tip that I learned from a cooking lesson recently. Use egg from the fridge to make chiffon cake, the egg yolk and white can be seperated easily. But you need a longer time to beat the egg white till stiff. Thks for your tips. I'm certain I have read somewhere in this website where the chiffon cake was baked in bath water method. If I'm not wrong it was the Pandan Kaya Cake. Two methods were illustrated, normal baking and the other water bath. When I baked my Pandan Chiffon Cake using the water bath method, the baking pan used was the normal round tin. Since it was so damp, I did not even proceed further in preparing the kaya filling. I am not an expert in baking but I have never heard of baking pandan kaya cake using water bath. Don't know why the recipe calls for that method. The cake is actually a sponge cake not a chiffon cake. Usually you are not supposed to use chiffon cake as a base for your pandan kaya cake. It will be too soft and too fine to support the kaya filling. 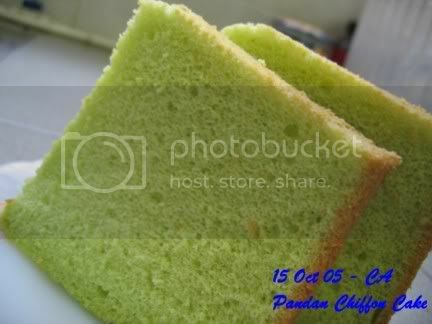 Ng, I have just checked and found the recipe which you were referring to is Pandan Sponge Cake posted by Gan55. Perhaps you need to check with Gan55 on what is the possible cause to your Pandan Sponge Cake. I have not tried this particular pandan sponge cake because I find the Optima flour/sponge mix are too sweet for my liking. Strange that your cake would be damp using the baine marie. If that is so, den have ur cake tin on a rack above the baking pan of water then. Will give it a shot again. Will let you know the outcome. Do u think it might be due to how I fold my egg white? My husband thinks the cake looks alright. What do you think? Hope to do it better next time. why do you say it don't look like a chiffon cake? 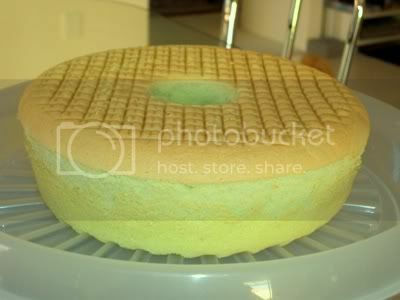 anyway my chiffon cake always look like this from outside.. but the inside always not well baked.. Your chiffon cake looks perfect to me. No crack at all. Mine always crack on the top. Why you said your cake is not like chiffon cake?